In Jensen v. Schooleys Mountain Inn…the defendant bar served alcoholic beverages to Jensen while he allegedly was visibly intoxicated. After leaving the bar, Jensen drove eight miles, where he “parked his car and, for some unknown reason, began climbing a tree.” The branches of the tree apparently could not support Jensen’s weight and one broke, causing Jensen to fall twenty feet to the river bank. Jensen either fell or rolled into the river and drowned. His estate tried to sue the bar for liability for negligently and wrongfully serving the decedent. Thankfully, they lost. At a press conference on Friday, Vice Dean Jesse Pierson of Blackacre School of Law announced that the school would like to “continue to foster the ‘grade school’ type of environment” by imposing a mandatory field trip for all first year students to the Philadelphia Zoo in March. “Students seem to be more receptive to a learning environment that seems more like high school than graduate school.” The field trip is the latest in a long list of changes that Blackacre Law have been established as of late. Vice Dean Pierson also spoke about the addition of lockers, assigned seating, a recess period, classic cafeteria food, and detention for students who are unprepared for class. Vice Dean Pierson noted that students must have a signed permission slip to go on the trip. Transportation will be provided by large, yellow buses. This could be an excellent candidate for The FAIL Blog. If only I had a basic image editing program to insert four bold characters. 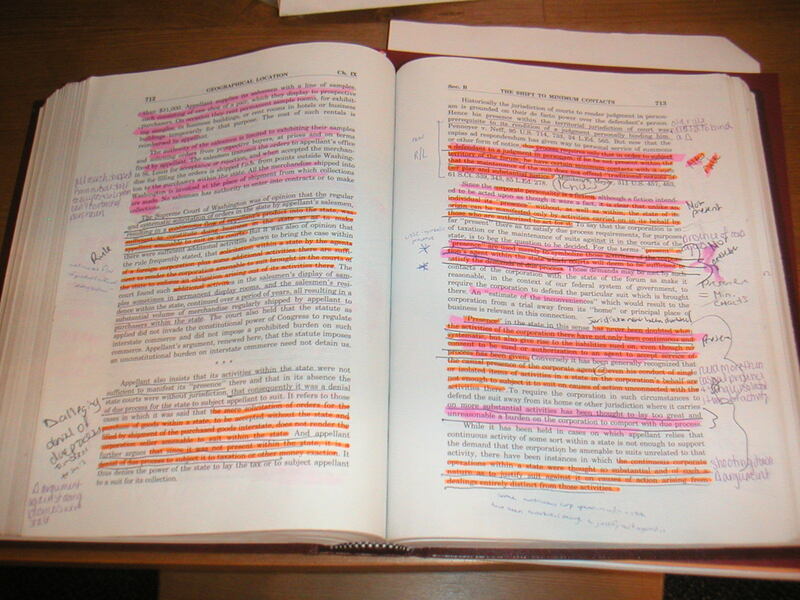 I can’t believe they sell used books that look like this to unsuspecting first year law students. I have not added any of my own notes to these pages yet, and honestly, if I get called on for this case, I’ll probably just hold up my book and point. I’m sure my Civil Procedure professor will understand.